A place to experience authentic Hawaiian Culture. We travel a lot and it is not very often that we happen upon a resort or Inn that we genuinely look forward to writing about. For the record, this is not a sponsored post. If you are looking for a Hawaiian beach resort this is not for you. If you want to immerse yourself in a small Hawaiian Inn with native Hawaiian hosts, this is a place you should consider. Kalaekilohana is not near a town. In fact it is set off the main road to south point on the big island of Hawaii. This is about as remote as you are going to get in Hawaii. 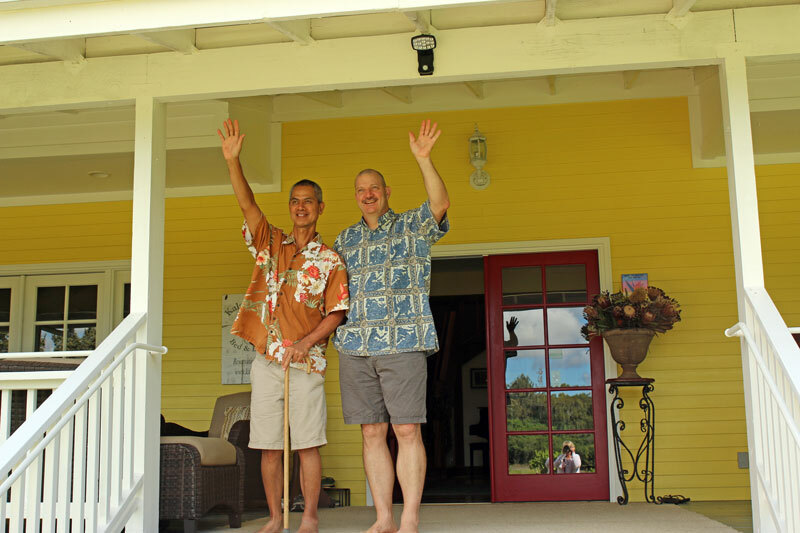 From the moment you drive into the front lawn of the beautiful Kalaekilohana Inn and are greeted by Kenny and Kilohana’s friendly wave, you realize that this place is special. Designed and built by the innkeepers, the facility is well thought out with lots of detail that takes a while to appreciate. There are many good reasons Kalaekilohana was named the#8 small hotel in America. In the unedited video below Innkeeper/Chef Kenny talks about Kalaekilohana. The Inn itself is small with only four units upstairs and a beautiful laundry space. The Inns design is inspired by the culture of Hawaii, and each room is large and uniquely designed with a lovely two tone color palette. Kenny & Kilohana designed and built the entire Inn starting in 2002 and finishing in 2005. It is a labor of love. The bathrooms are beautifully laid out, decorated and appointed with everything you could possibly need. The shower in our room was huge and had ceiling rainfall shower heads. There are lots of nice touches in each unit like the USB charging station which was just what we needed with all of our computers and camera gear. Being well off the main road to south point, it is very quiet and restful at Kalaekilohana. Our room had a nice deck off the rear of the building that had a great view of the ocean in the distance. I took advantage of the setting one morning to get some much needed work done while taking in the scenery. This gallery of photo’s will give you a good idea of the gracious bedroom spaces the Inn gives it’s guests. This is definitely not a hotel, but a true and welcoming Hawaiian home. Being an Inn, Kalaekilohana stays include a fabulous breakfast. We found the food to be exceptional and chef Kenny will proudly explain how the food is locally sourced. The atmosphere could not be any better. Because of the remote location we opted to have dinner at the Inn during our stay. It turned out to be a great choice both for the culinary delights that were served, and the company we shared. During our stay we met a couple from Seattle and a couple from France and Australia who it turns out, manage a resort in Vanuatu. Kitchen where Chef Kenny works his magic. 100% Ka`ū Coffee served up hot and friendly. The first floor contains the social spaces of the Inn where cooking, eating, music and conversation are the main elements of a good stay. Another feature I found interesting were the creative feather arts on display in all the rooms, and a beautiful collection of leis. Kilohana shared some of his work, and explained the Hawaiian history and tradition behind the larger feather objects. Being a jeweler, I was fascinated by the textural beauty of the simple lei. We hope this gives you a good sense of the Inn and it’s two gracious Innkeepers, Kenny & Kilohana. We highly recommend you look them up and make a point of staying at their authentic Hawaiian Inn. A couple of must see things to visit near Kalaekilohana are the Green Sand Beach and the South Point Lookout. Are you ready to stay at Kalaekilohana? Click Here. For more information on Kalaekilohana, visit their website HERE.